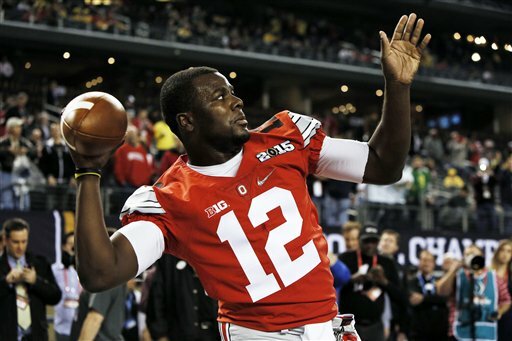 It’s the Ohio State Buckeyes vs Oregon Ducks in the college football national championship on Monday night. Kickoff is slated for 8:30 p.m. EST, though the game will likely start at least a little later then that. Live streaming will be available via Watch ESPN. Ohio State is the underdog in the latest odds. 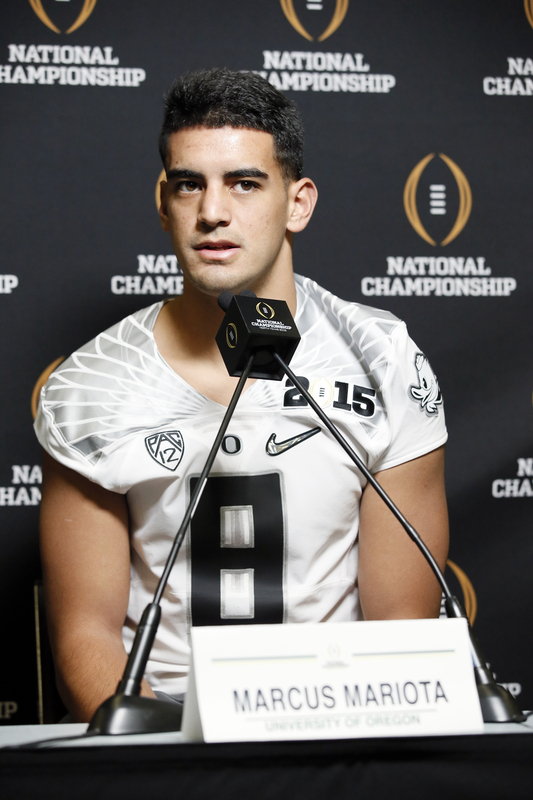 The game, the first ever college football championship, will feature a number of NFL prospects–the biggest likely being Oregon Oregon quarterback Marcus Mariota. Oregon also has several linemen who will likely go in the 2015 draft–tackle Jake Fisher, and center Jroniss Grasu. Defensive lineman Arik Armstead is reportedly leaning toward declaring after his junior year, while defensive end/outside linebacker Tony Washington will likely go in the later rounds, reported Sports Illustrated. The Ohio State prospects include tight end Jeff Heuerman, wide receiver Devin Smith, cornerback Doran Grant, linebacker Curtis Grant, and defensive tackle Michael Bennett. DALLAS—When Michael Bennett makes a tackle, he wants people to think of someone else. The guy whose jersey he’ll be wearing in the national championship game. Karageorge is believed to have taken his own life at the end of November, the walk-on nose tackle dying of a gunshot to the head after sending a message to his parents saying concussions had rattled his mind. The death was a jarring blow to the Buckeyes. Most of the players had never lost a friend so close to their own age, their first real brush with mortality. Since Karageorge’s body was found in a trash bin, a day after Ohio State beat rival Michigan, the Buckeyes have clearly been a team on a mission. They blew out Wisconsin 59-0 in the Big Ten championship game, claiming a spot in college football’s first playoff. Then they stunned top-seeded Alabama 42-35 in the Sugar Bowl semifinal game. Now, even as underdogs for the third game in a row, they see no reason why they can’t bring a title back to Columbus. The investigation into Karageorge’s death could reveal the dark side of college athletes, especially if it turns out that his brain was damaged by repeated concussions during three years as a college wrestler. The 22-year-old senior joined the football team in August, readily taking on the thankless duties of the scout team, playing a role on the opposing team to get the starters ready each week. Karageorge never played in a game, but he won over many of his new teammates with his love of practice and exuberant personality. That’s what the Buckeyes (13-1) were determined to remember as they prepared for Monday night’s championship game against second-seeded Oregon (13-1). Bennett and Elliott will be among those honoring their late teammate in the title game. For the third game in a row, Bennett will wear Karageorge’s number instead of his own No. 63. Elliott plans to again wear a small white towel tucked into the front of his pants, with the words “RIP Kosta” written in black marker. “I wear the number because I want people, when they see me, I want them to think about Kosta,” Bennett said. When asked about the impact of Karageorge’s death on his team, Meyer was quick to point out that he hasn’t tried to use tragedy as a motivational tool. He certainly doesn’t mind his players honoring a friend in their own way, but he doesn’t want to make it more than that. In the grand of scheme of things, this is just a football game. That was a young man’s life. Sure, if he’s holding the trophy late Monday night, he’ll probably look toward the roof of AT&T Stadium and give a wink to his friend. But win or lose, this season will stay with him forever because of who wasn’t there at the end.